The latest version 6.2 of our software solution comes with a new option that allows the easy integration of external preflight applications. It provides complete new ways of not only checking print files but also of repairing them. What is this new option about? The new option JT Preflight Connector connects external preflight applications, so that you can make use of their functionality within our software solution Konica Minolta JT Suite 6. The advantage is that the checking and repairing of print files is seamlessly integrated into the workflow. It is performed automatically during the upload or submission of the print data. It saves time and avoids errors when printing. Which external preflight applications are supported? 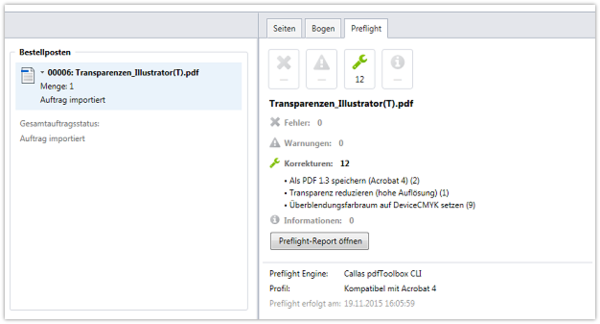 Both preflight applications come with a variety of predefined preflight profiles which define the quality rules that are applied on incoming print files. Of course it is also possible to create your own profiles. By the help of the JT Preflight Connector these profiles are made available within our software solution. In the configuration area of our software, you specify which preflight profile you want to use for checking a particular product. You can therefore use for brochures another profile than for business cards or for color prints a different profile than for black and white prints. When print files are uploaded or submitted, the data is checked automatically. In the job list, you'll see a note if errors were detected or repaired. Additionally you can open a detailed report. Where can I get this new option? You can purchase the option at your local Konica Minolta dealer. The JT Preflight Connector is a chargeable option for Konica Minolta JT Workflow 6, which means you need Konica Minolta JT Workflow 6 as prerequisite in order to use the option. Please note that the JT Preflight Connector only enables the connection to external preflight applications. The applications itself are not part of the option.